With 2:14 remaining in the second period, University of Vermont captain Yvan Pattan skated to the penalty box and the No. 11 Boston University men’s hockey team went to the power power play for the fourth time in the frame. It was another opportunity for the Terriers to crawl back from a one-goal deficit. But just as the three previous tries, the Terriers failed to convert. The lack of execution on the man advantage wasn’t the be-all and end-all of this Friday night game against Vermont, but it was a microcosm of a larger issue — the Terriers (7-5-3, 3-3-3 Hockey East) were underwhelming in all facets of the game. They were outhit, outskated and outscored in what ended as a 4-2 loss to the Catamounts (4-9-2, 3-4-2 Hockey East). Vermont scored twice in the final 10 minutes of the third period to break a tie and then go ahead for good. The win ended Vermont’s (4-9-2, 3-4-2 Hockey East) four-game winless streak and was also BU’s first defeat in Hockey East play since Oct. 30. 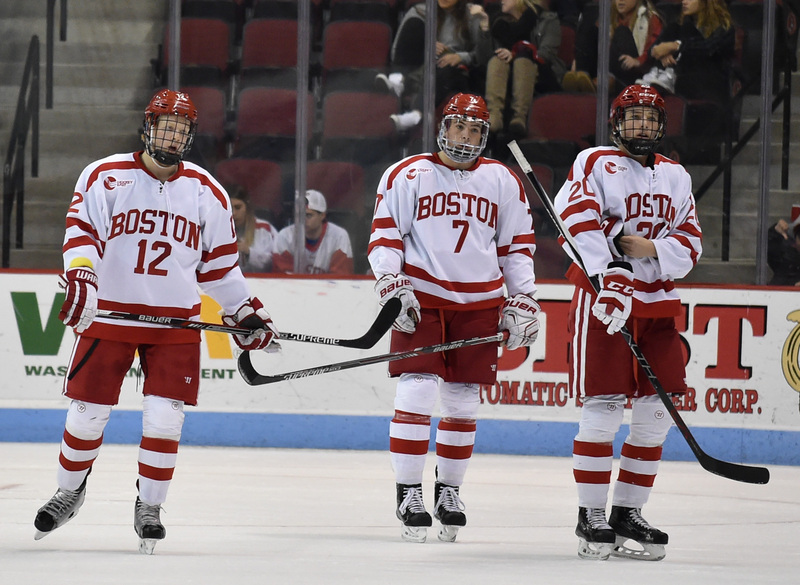 As BU head coach David Quinn put it, there were few positives to take away. “Just really disappointed with our performance tonight,” Quinn said. “Complete lack of emotion, complete commitment to physical play, just really disappointed and you’ve not no chance when you don’t play with passion and emotion and enthusiasm, and for some reason we didn’t have any of that tonight and the better team won. For the first 10 minutes of the game, though, the Terriers actually played sound hockey. They came out with energy and tested Vermont goaltender Mike Santaguida. From an unexpected scoring source at 8:41 of the period, BU got on the board. Junior forward Tommy Kelley, standing at the top of the right point, unleashed a slap shot that beat Santaguida high glove-side. Kelley, playing in his fourth game of the season, notched his first goal since Dec. 6, 2013. Yet, as the period moved along, that would be the only moment that would make Quinn and the rest of the Terriers happy. The BU lead only lasted about five minutes, and the Catamounts began to take control. A Vermont power play that came into the game having converted under 10 percent of its chances — 11th in Hockey East — found its stride. Forward Anthony Petruzzelli was open in the right circle and used a well-placed screen in front of the BU net to score his fourth goal of the season, tying the score. Not even two minutes later, junior defenseman Doyle Somerby lost the puck in his own end and created a short breakaway for center Jarrid Privitera. The one-time BU recruit skated in on goal and beat senior goaltender Sean Maguire down low. Maguire ended the night with 26 saves on 29 shots, but the play from the skaters in front him made life somewhat difficult. Aside from falling behind at the end of the frame, another tough play beset the Terriers. Sophomore forward Nikolas Olsson, playing in his second game since returning from an upper-body injury, appeared to injure himself on a hit near the Vermont bench. He skated off the ice and did not return to the bench. He was seen in the stands later in the game wearing a sling on his left arm. More frustration set in for the Terriers in the second period, when they not only failed to put the puck in the net on the four power plays, but they also missed the net 11 times. When they did hit the net, Santaguida was there to stop all the shots, making 11 of his 28 saves. Quinn said after BU’s matchup against No. 15 Cornell University last Saturday that BU’s power play needed to get better. Friday night, it didn’t. So, after the game, Quinn was frank in describing the ineffectiveness of the man advantage. The Terriers, however cashed in early in the third to draw even. Freshman forward Jordan Greenway won a puck battle in corner behind the UVM net and fed an open Lane in the slot. Lane spun around and shot the puck low off the post and into the net. But any hope of another late, come-from-behind win faded away with 9:05 left in the third. The Catamounts went back on top, thanks to the great passing of freshman Liam Coughlin and finishing touch of Brendan Bradley. Coughlin dished a blind pass behind his back to Bradley in front of the net. Bradley had all but an empty net to shoot at, and he buried his second goal of the season. Coughlin would add a second point to his night with an empty-netter that beat the buzzer by milliseconds. Taking into account all of the mistakes and general sloppiness of the game, Quinn said changes could be coming to the lineup for Saturday’s matinee. But would he go as far as starting junior forward Nick Roberto, who has yet to crack the lineup this season because of disciplinary reasons?